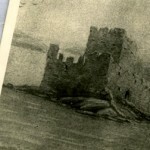 A short letter from Dolly Doctor to another great Uig historian, Murdo Macleod (Murchadh Chaluim Sheoras, Crowlista and Glasgow), about the old Stornoway Castle and DD’s activities with the Old Folks Association and his Folk Museum. 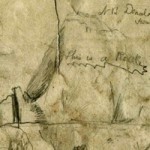 This drawing of Stac Dhomhnaill Chaim – the fortified rock on the Mangersta coast, in which Donald Cam Macaulay lived – is from 1849 and shows the crumbly access to the stack even then. A new addition to the museum this month is the bell from the shipwrecked Esra, kindly loaned by John Murdo Mackay, 1 Carishader. 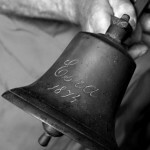 The bell was used at Buth Iain Uisdean, his grandfather’s shop. Is còir san Fhaoilteach na trì claisean taobh-ri-taobh a bhith làn uisge is làn sneachda is làn tugha nan taighean, or trì làin anns na claisean; uisge, sneachd is tugha nan taighean. In February the three furrows side by side should be full of water, full of snow, and full of house-thatch.